It’s funny how things intersect. Two days ago I would never have guessed I would be talking about whiteness as a verb in the context of the PGA. Yet, that is precisely what I find myself doing. On Monday Sergio Garcia threw the latest verbal punch at Tiger Woods in what has been a war of words since the Player’s Championship. He responded to a question regarding if he planned to have dinner with Woods at the US Open with pure racism: “We will have him round every night. We will serve fried chicken.” Garcia has already issued the requisite I am sorry if you took offense I’m not a racist apology and time will tell if folks will accept that or not. However, it should be made clear that comment is racist and Garcia, if only through passive collusion, is a racist. See whiteness is a verb. It means something to be white, it has consequences, it acts on the world. Most of the time this is not made obvious. Most people who are perceived as white will go on about their day believing they are moving neutrally and benevolently through the world with their whiteness being simply an adjective, or noun, used to describe them. They are wrong. It becomes apparent they are wrong at times like these. 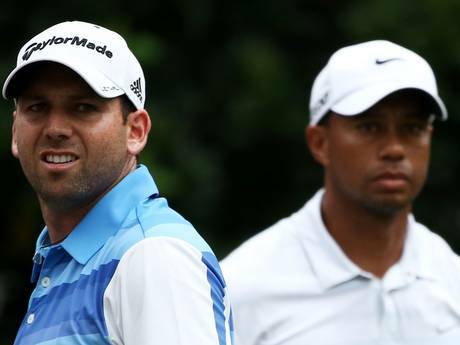 Sergio Garcia doesn’t like Tiger Woods. He is probably upset he just lost to Woods in a high profile event. He is probably also salty that Woods is not backing down in the media. It is here that whiteness comes into play. Garcia knows Woods is black, he also knows the history of this country in regards to blacks. So, presumably looking to hurt Woods, Garcia actively invokes this history with his fried chicken comment. That is what racism looks like and the actions of a racist. Garcia is, whether he knows it or not, appealing to the sense of superiority whites feel over blacks stemming from the centuries of dehumanization that have taken place. He wants us to conjure up stereotypical images and feelings of blackness, why else bring up the stereotype? Here’s the kicker, how we handle this will say a lot about who we are as a people. See it is one thing to chastise Garcia (which he deserves) for speaking, or making public, the activeness of his whiteness, it is all together another thing to think about making that whiteness dormant. That would take us, collectively, way out of our comfort zone. We like our whiteness to act but act silently, to be covert. It is no longer acceptable to showcase how active your whiteness is by demanding segregated restaurants, schools, and neighborhoods, or by publically invoking stereotypes. However, it remains acceptable to allow our whiteness to act, in fact it is preferable. By acting on the low whiteness has re-segregated schools, kept the wealth gap solidly in place, secured employment opportunities that might otherwise be hard to come by, and made sure the face of prisons is brown and black. Not to mention has the first black president of the United States continuously scolding communities of color about their issues while remaining silent if not in support of the pathologies of whites. The misunderstanding of white as an adjective, or even a noun, serves one purpose: granting whites “plausible deniability.” Whites can point to the Sergio Garcia’s and say “see, I am not that” without ever having to examine the activity of their own whiteness. If we did examine it we would see how absurd the idea of colorblindness truly is. In fact, colorblindness actually betrays the racism at its core. It says we cannot, and should not, notice color. Why not? Could it be because we understand that white means something, and that it equates to privileges for whites that are clung to as tightly as life itself? I would argue that is indeed what colorblindness means. It has little to do with not seeing blackness and everything to do with not seeing whiteness. So, I can’t help but wonder, what is the push back of Garcia really saying? Is it truly a condemnation of racism? Or, is it a condemnation of him making his whiteness visible and running the risk of shattering the myth of passivity and colorblindness? Next: Next post: Undermining The Social Order… Yes Please!